Have a slice of paradise! 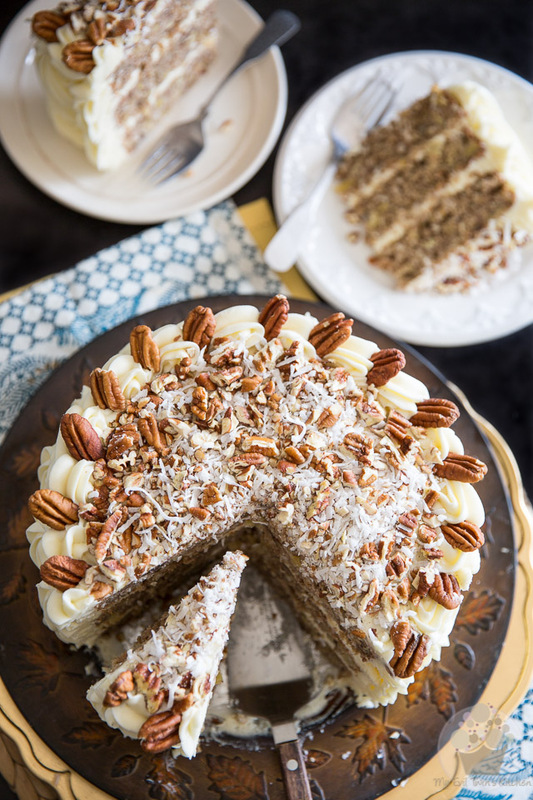 Hummingbird Cake was given an additional twist and made even more tropical thanks to the addition of shredded coconut. If I have to be totally honest with you, this was my very first face to face encounter (or was that fork to mouth, rather?) with a Hummingbird Cake. 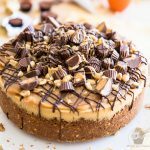 Now you must think that I have quite a lot of nerve to go ahead and tweak the recipe to such a great classic without even trying the real thing first. But you see, the thing is for me, the combination of banana and crushed pineapple, and the very tropical nature of this classic dessert simply called, screamed for the addition of coconut. And so, I did! Quite frankly? Even though I’ve never had the “real thing” before, now that I’ve tasted this slice of paradise, I don’t think that I would, or could, ever have it any other way! 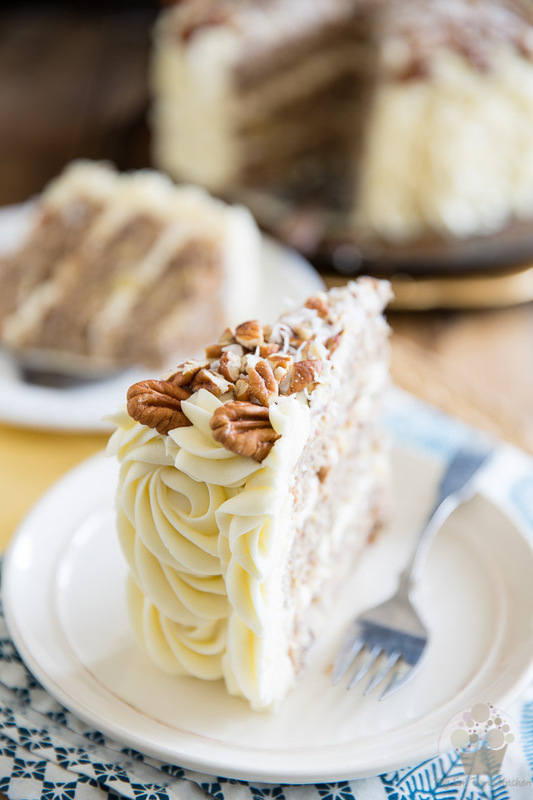 Hummingbird Cake, in my opinion, totally calls for this additional little twist and should absolutely, imperatively, always contain shredded coconut. By default! You’re looking at a cake that is seriously moist, tasty, rich and buttery, slightly spiced, and covered in a thick layer of the most delicious perfect pipeable cream cheese frosting. 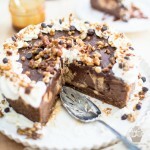 I say it’s the perfect cake for just about any occasion! 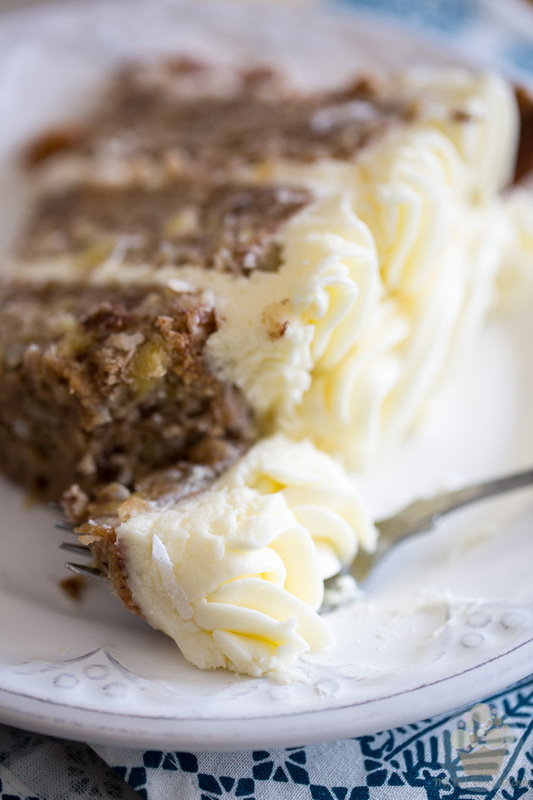 Even if you think you are not a fan of banana, or banana bread, don’t let that stop you… while there are quite a few bananas that go in the making of Hummingbird Cake, the banana flavor really isn’t that present. In fact, you can barely even notice it at all. 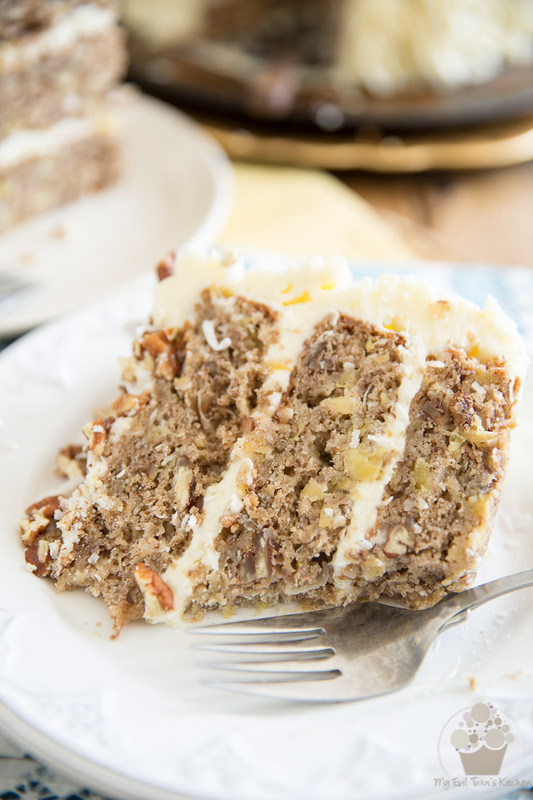 Whether this is your first time having Hummingbird Cake, or you’re a true connoisseur, I’ve no doubt that you will fall head over heels for this coconut-y version. As always when any baking is involved, the first thing you want to do is preheat your oven. The target temperature this time is 350°F. 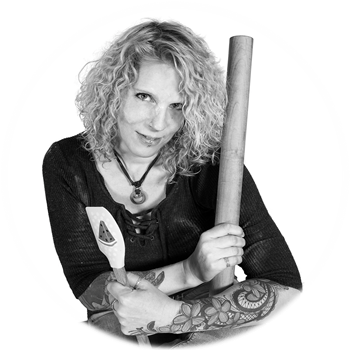 Then, grease 3- 8″ round cake pans and, just to be absolutely certain that nothing sticks to them, line the bottom with cut-out circles of parchment paper. Next, in a large bowl, combine the flour, cinnamon, baking soda, salt, ground ginger and nutmeg. Mix well with a whisk until fluffy and well combined. Set aside. 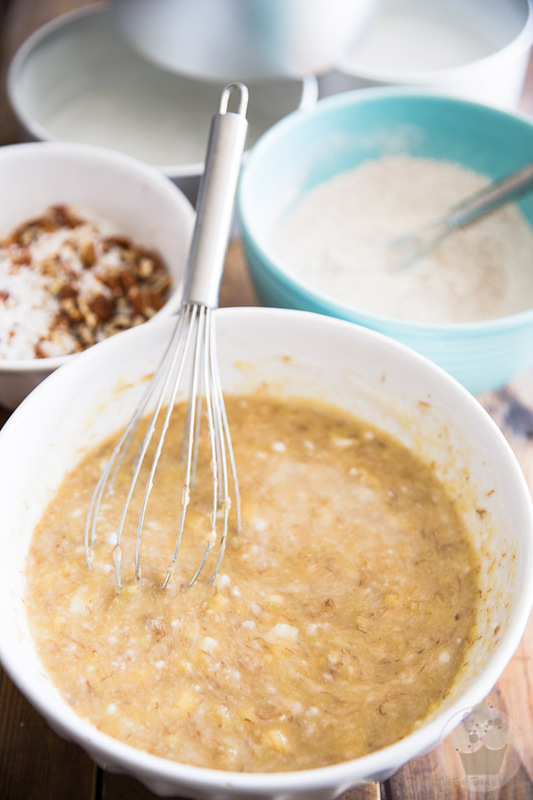 Then, in a separate bowl, combine the mashed bananas, crushed pineapple, eggs, melted coconut oil, granulated sugar, brown sugar, buttermilk and vanilla extract; mix vigorously with a whisk until well combined. Now about the crushed pineapple, you don’t have to drain it until there’s not a single trace of liquid anymore; all I did is I opened the can, held the lid with my fingers while applying a slight pressure on it and tilted the can to pour out the excess juice. 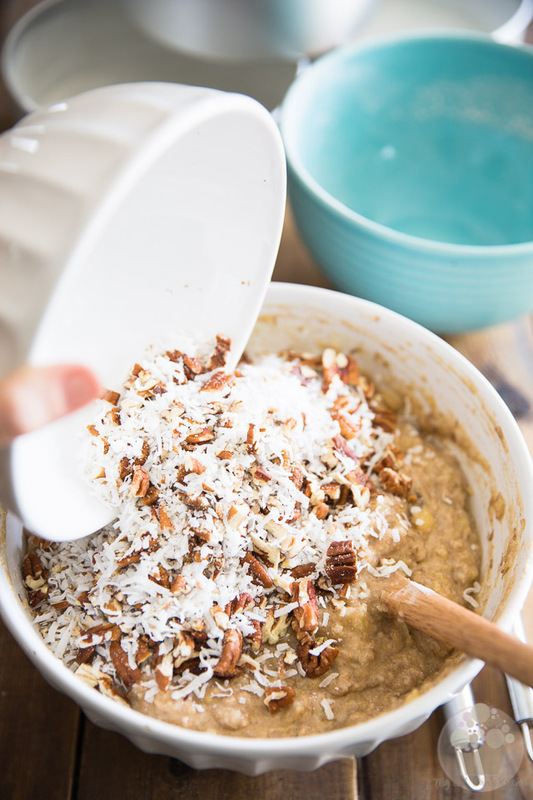 … and then fold in the chopped pecans and shredded coconut. Again, mix until just combined, no more. Divide the batter equally between the 3 prepared cake pans; you should be looking at about 715 grams, or 25.2 ounces, per pan. 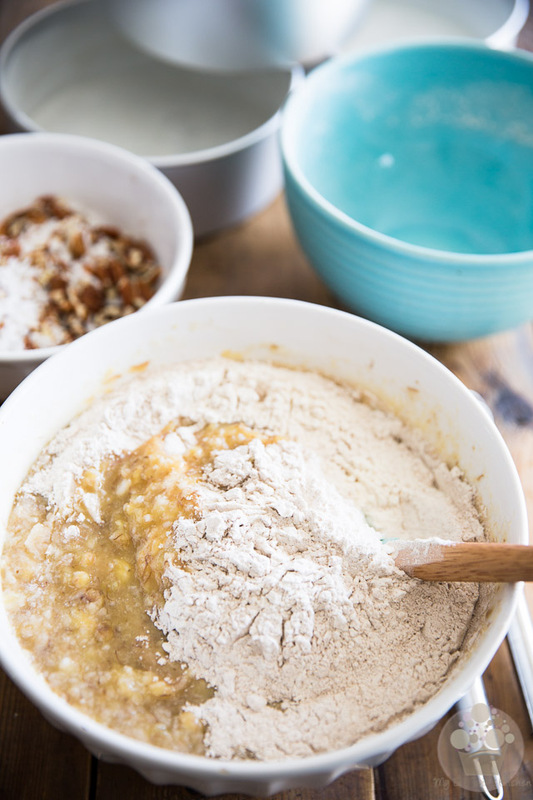 Delicately spread the batter all the way to the edge, as evenly as possible. I find that a small offset spatula works real well for this task. Bake the cakes in the preheated oven for 35-40 minutes, or until the edges of the cake take a nice golden coloration, the tops look set and a toothpick inserted in their center comes out clean. Let the cakes rest in the pans for a few minutes and then delicately turn them onto a cooling rack. Let them cool down completely and then transfer them to the refrigerator until they are completely chilled before frosting. 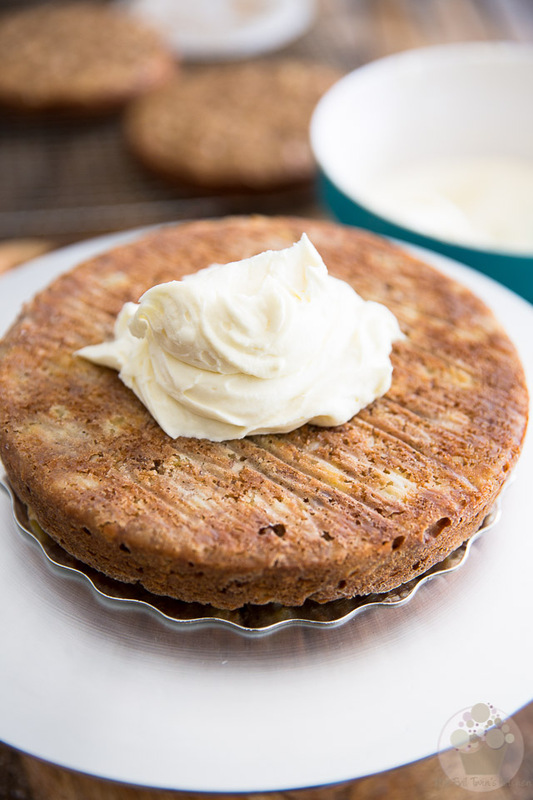 To make that cream cheese frosting, you’ll have to leave this page for a little bit, so you can follow the recipe and instructions in the other post. 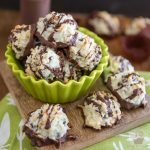 Just click the link and the recipe will pop-up in a separate window. Then, when it’s all said and done and you’re ready for some frosting action, you can return here to finish the cake! 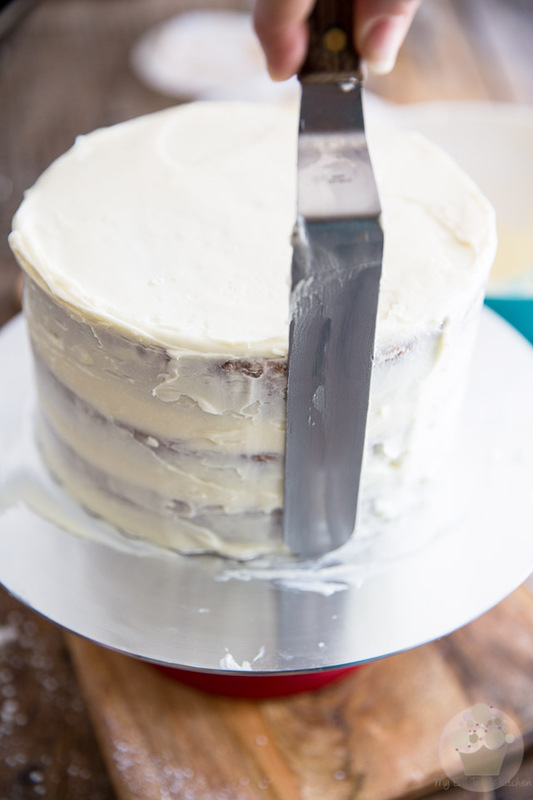 Once your cakes are fully chilled, place one of the cakes, flat side up, on a cake board or plate and, using an offset spatula cover it with a generous layer of frosting. 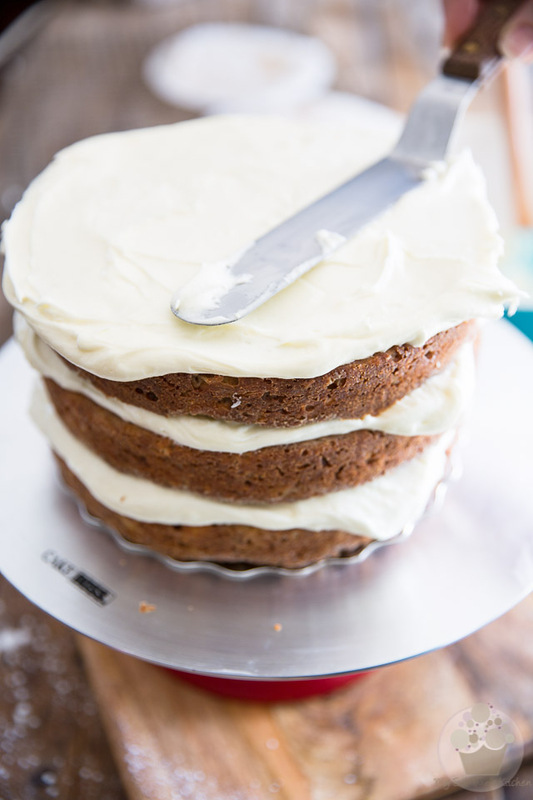 Now crumb coat the entire cake with a thin layer of icing, making certain that you fill all the cracks between the layers as you go. 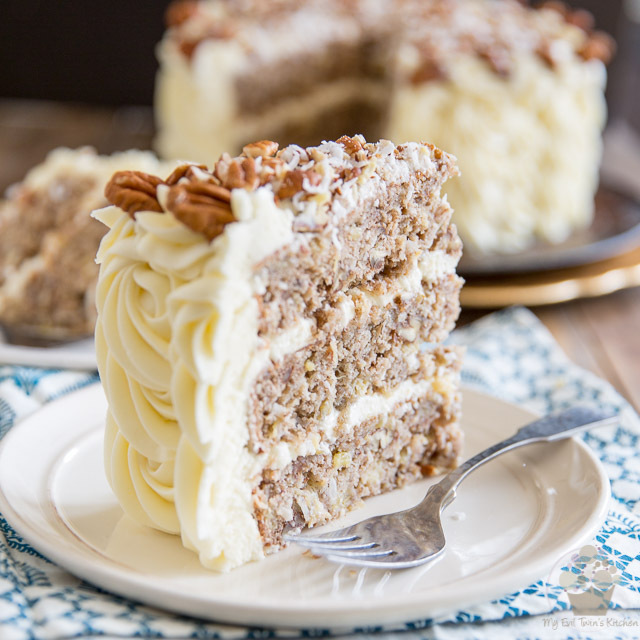 Once your cake has been completely crumb coated, pipe big swirls of icing all over the side of the cake and small shells around the top edge, then garnish that top border with pecan halves. To cover the sides, I followed this technique and used a Wilton 2D closed star tip. For the top border, I used a Ateco #2 closed star tip. 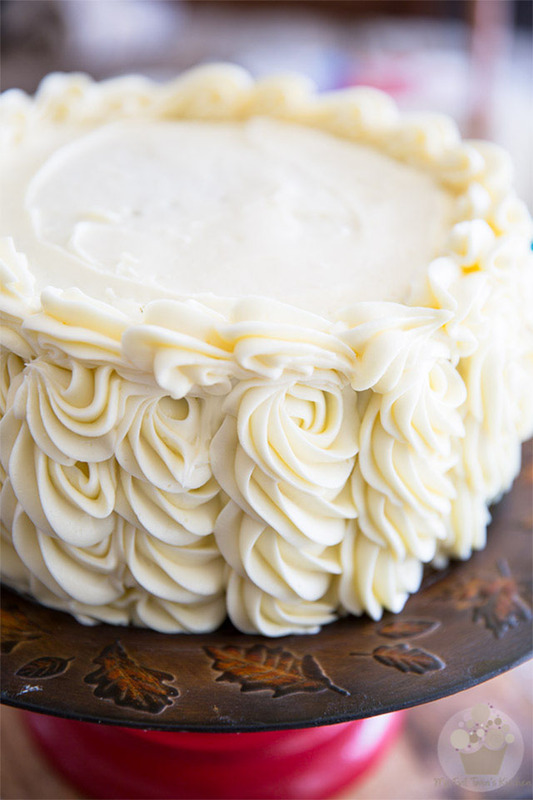 Oh, and before you start covering the sides of your cake, make sure that it is resting on its final, official serving plate, as once once that piping’s been done, you won’t be able to move your cake without damaging the bottom swirls. Trust me, I speak from experience! I once made that mistake and had to start over. Not fun! 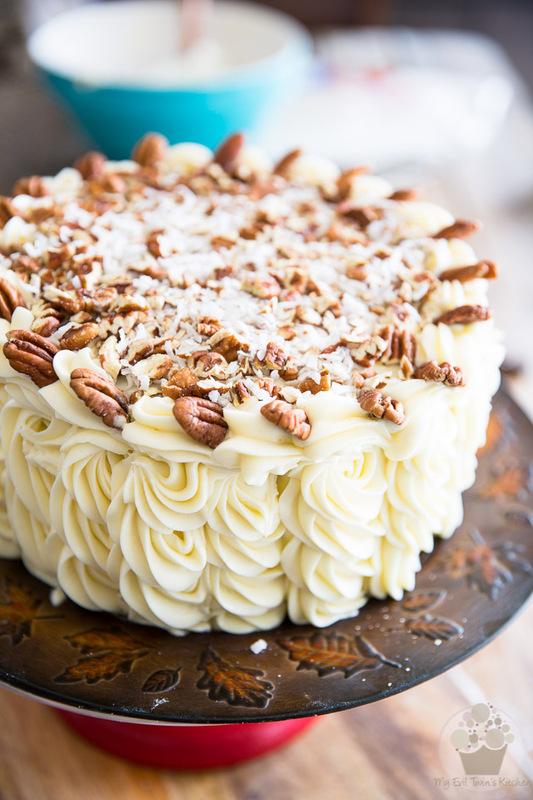 When the cake is completely covered in delicious cream cheese frosting, combine the chopped pecans and shredded coconut and sprinkle that mixture all over the top of the cake. And there you have it, your cake is now all done and good to go! 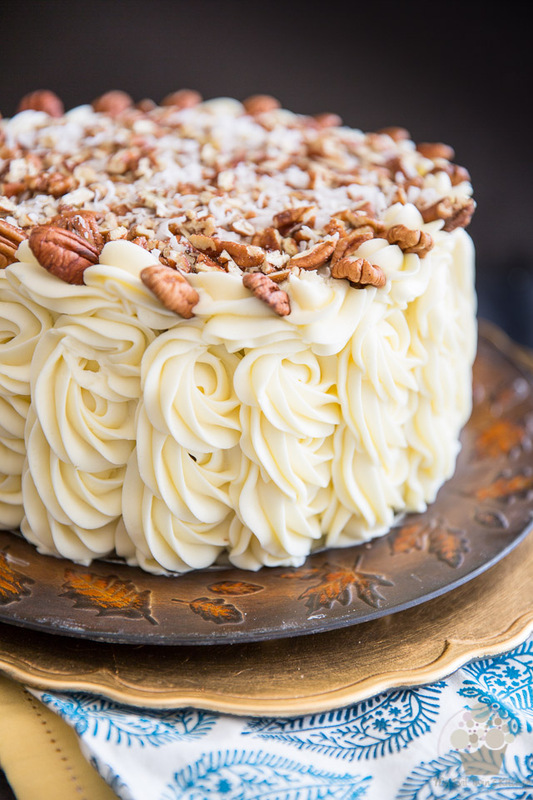 Since cream cheese frosting is fairly delicate and tends to soften quickly, I strongly suggest that you keep your cake in the refrigerator until ready to serve. Preheat your oven to 350°F. 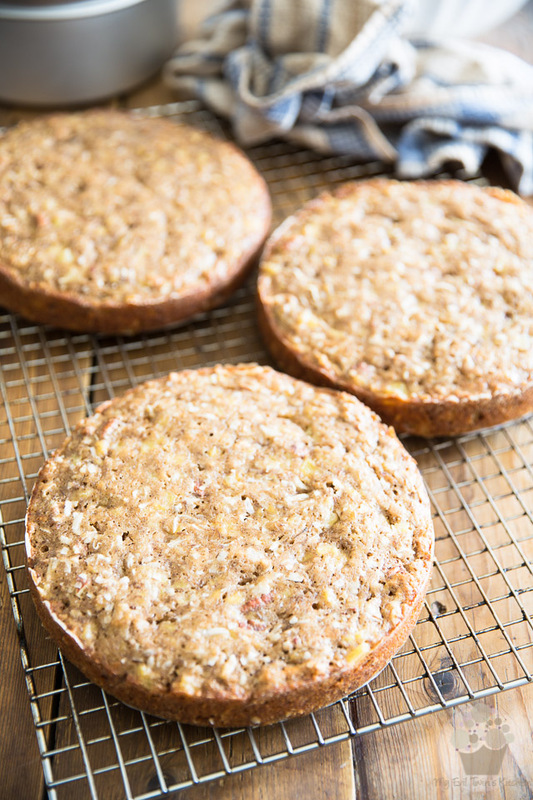 Grease 3- 8" round cake pans and line the bottom with parchment paper. 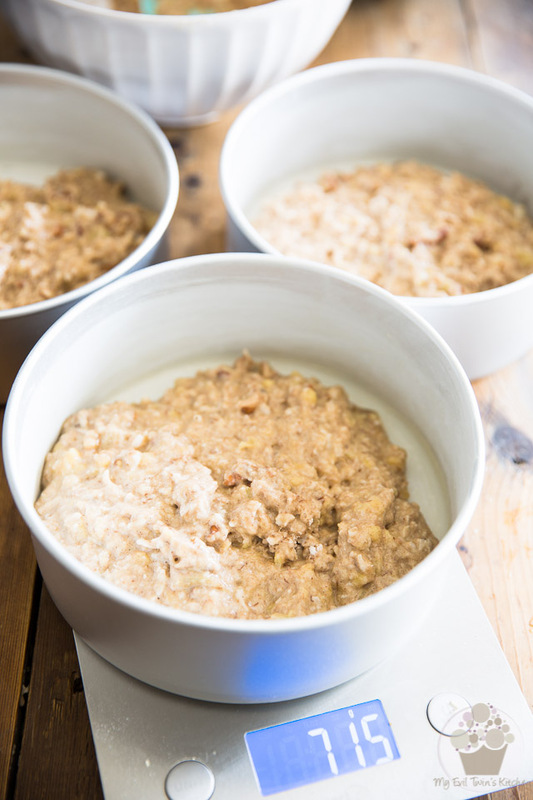 In a large bowl, combine the flour, cinnamon, baking soda, salt, ginger and nutmeg. Mix well with a whisk until fluffy and well combined. 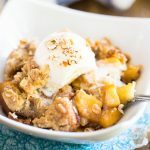 In a separate bowl, combine the mashed bananas, crushed pineapple, egg, melted coconut oil, granulated sugar, brown sugar, buttermilk and vanilla extract; mix vigorously with a whisk until well combined. 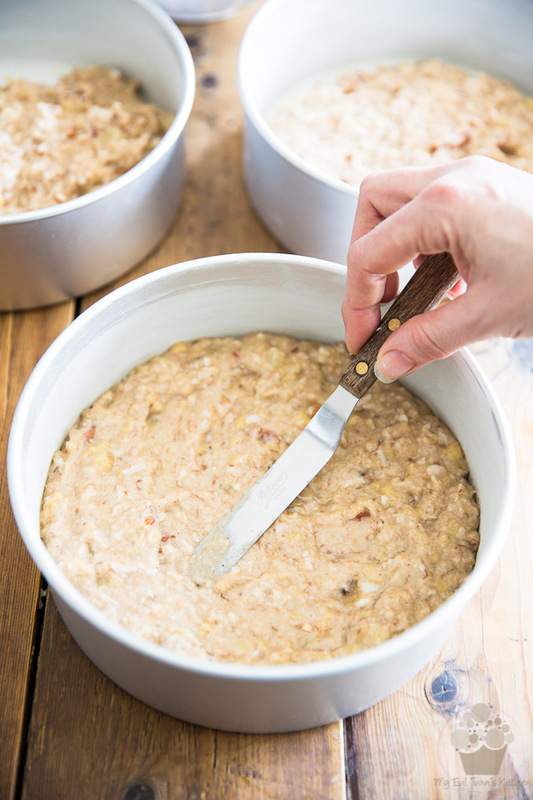 Stir in the dry ingredients with a wooden spoon or rubber spatula and then fold in the chopped pecans and shredded coconut. Mix until just combined, no more. Divide the batter equally between the 3 prepared cake pans; you should get about 715g (25.2oz) per pan. Bake for 35-40 minutes, or until the edges of the cake take a nice golden coloration, the top looks set and a toothpick inserted in the center comes out clean. 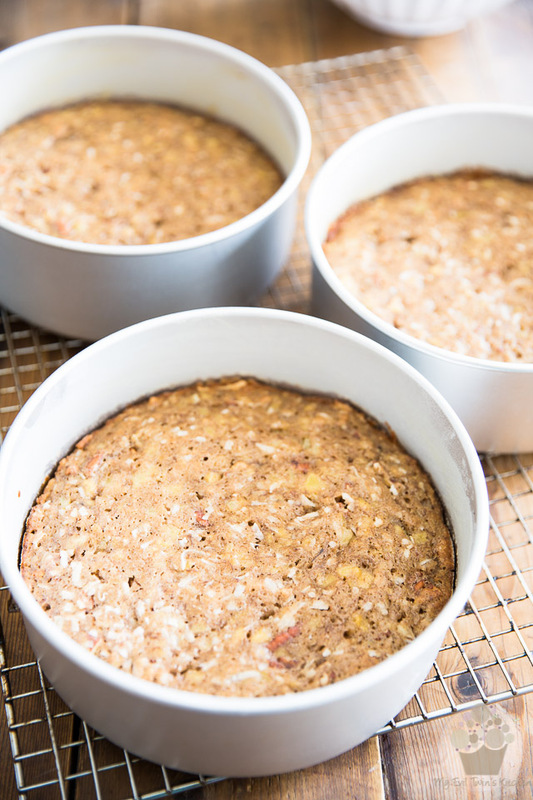 Let the cakes rest in the pans for a few minutes and then delicately turn them onto a cooling rack to cool down completely, then transfer to refrigerator until completely chilled before frosting. 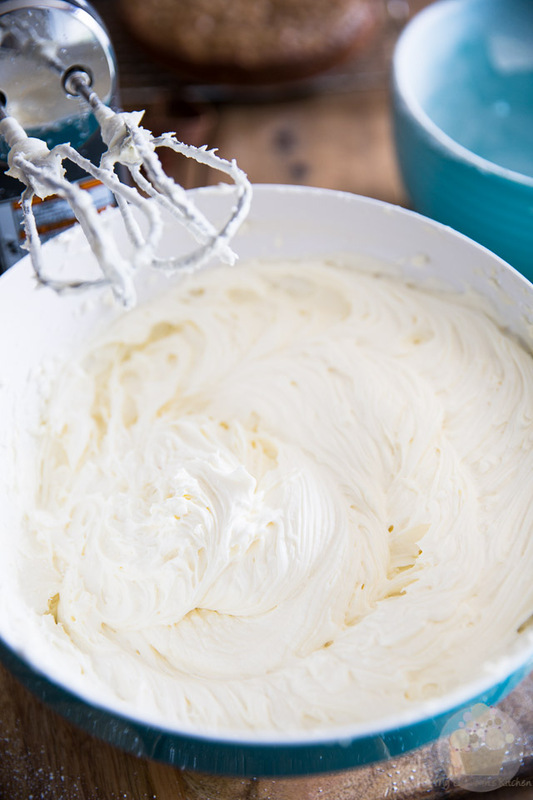 Make the cream cheese frosting following the instructions in the post. Once chilled, lace one of the cakes, flat side up, on a cake board or plate and, using an offset spatula cover it with a generous layer of frosting. Repeat this same process with the other 2 layers and then crumb coat the entire cake with a thin layer of icing, making certain that you fill the cracks between the layers as you go. Once your cake has been completely crumb coated, pipe big swirls of icing all over the side of the cake (I used this technique with a Wilton 2D closed star tip) and small shells around the top edge (I used a Ateco #2), then garnish that border with pecan halves. 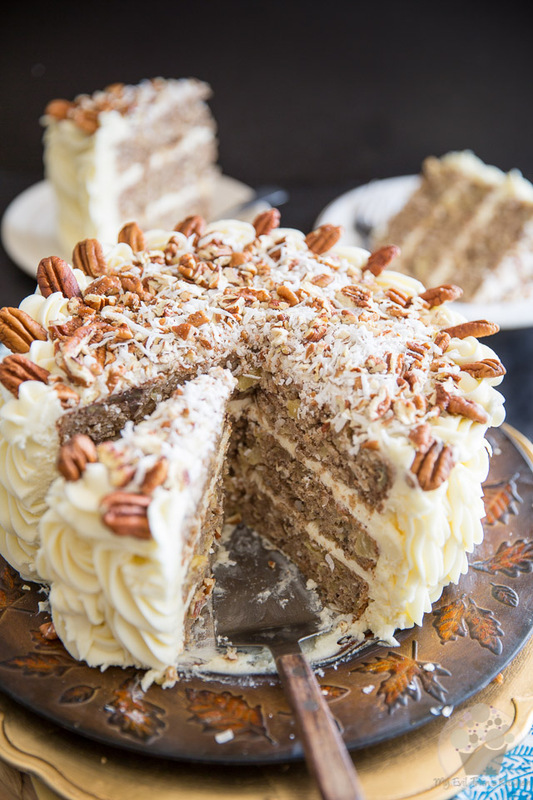 Finally, combine the chopped pecans and shredded coconut and sprinkle that mixture all over the top of the cake. Late to the party, but wanted to let you know that I just made your cake for a birthday celebration. Wow!! Delicious and devoured by everyone. Thanks for the recipe, it’s a keeper. You are very welcome, Melissa. Glad you guys loved the cake!